We are inching closer and closer to the end of this week! This week has flown by so quickly and I am still in awe that Thanksgiving and Christmas is getting so close and is literally right around the corner. 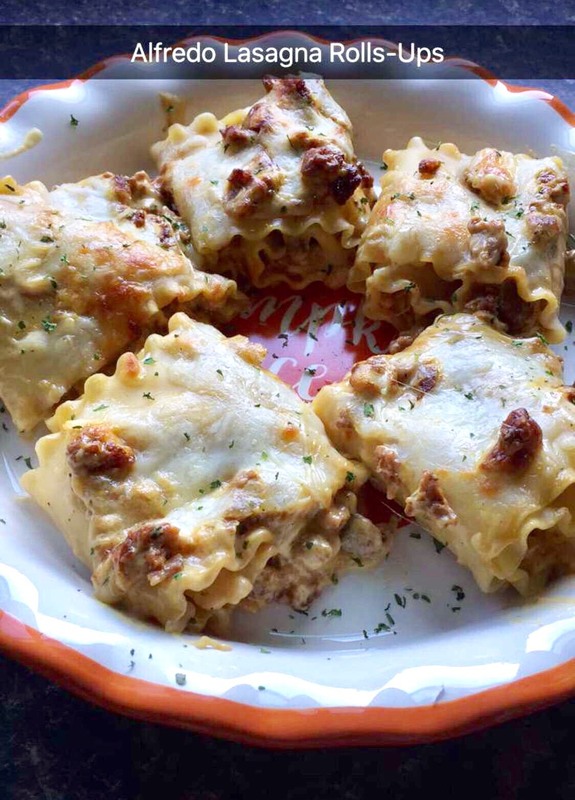 One of my favorite meals to cook when it starts getting colder outside is lasagna! You get to turn on the oven and the house gets nice and toasty, and bonus points- the house gets to smell delicious. Gooey cheeses, meats, and sauces- and did I say CHEESE? Tons and tons of cheese! Luis’s father introduced me to the concept of creating a lasagna with Alfredo sauce, and my world has never been the same since. I never thought of making a lasagna with Alfredo before, normally I would make my lasagna with vodka sauce and a mixture of cheddar and mozzarella (which I highly recommend). After creating my version of lasagna with Alfredo sauce, I fell in love and I continue to make variations of this dish. So today’s variation will be roll-ups style. I want to thank the Tasty App for the amazing idea! The great thing about lasagna is that once you know the basics of layering, and honestly there is no wrong way to layer since its more a personal preference, you can turn any lasagna into your very own and customize it to your liking. All the ingredients listed below are my go-to’s but please use whatever brands you prefer, or you can give my recommendations a try and let me know how they work out for you 🙂 ! First and foremost you want to start with the pasta and I always use Barilla as my pasta preference. I sadly do not know yet how to make lasagna from scratch, so store bought works perfectly for me. Next, choose the meat you’d like to use. I would recommend either turkey or chicken, as they are the best to go with Alfredo. I have never tried using beef, pork, or any other meat with Alfredo, but if you are feeling adventurous, give it a try! What really gives my lasagna its flare is the way I season the meat! I always, always, always season all and any meat I cook with La Choy Soy or Teriyaki sauce and Goya Sazón. Both products can be found in the “International Section” of most supermarkets. These additions have been my secret weapons and really pack a flavorful punch to your cooking. Then I normally add any other seasonings I find in my pantry. If you do yourself any favor, please use BLACK PEPPER! I use a nice heaping of black pepper for this dish and WOW! It tastes absolutely wonderful. And last but not least my favorite part, the cheese!!! You know it’s my favorite since it’s almost empty, haha! Thank you much Lisa! Please let me know how it turns out!